For a long time, a realllllllllly long time, Matty & I have been singing the praises of Haribo. Hell, they’re the reason we started this site. But they’re not perfect. One gripe I’ve had over the years is that, while they do pump out a lot of varieties, the majority of them are just different shaped/themed gummies with the standard (excellent) Haribo flavors. That’s why a variety like Twin Snakes, with a completely sour gummy without sour powder involved was exciting. It was different. 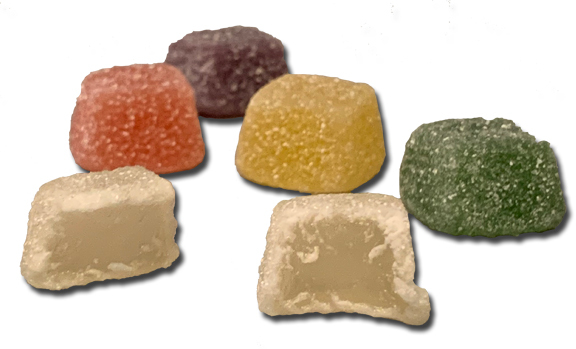 But really…these new Sour Cubes are clearly very different. Let’s start with the format. These aren’t the same kind of gummy you’re accustomed to from Haribo. While they’re definitely not a fruit jelly, they’re about halfway between jelly and gummy. I love that. When you take a bite, it bites clean, but it has body and sproing to it. Neat. Fun. New. It says “exotic flavors” on the front of the bag, and man….they’re not kidding. Ready? Dragonfruit, Gooseberry, Blood Orange, Plum, Mango & Passionfruit. Are you kidding me? I would have been happy with just one interesting flavor, but arguably, this holds 5-6. Mango is pretty common these days, but still, it’s fresh. The idea of a plum gummy/jelly my friends…well that was one of my early dreams, when the Candy Gurus were contemplating actually making candies. But now…we don’t have to. They’re here, and they’re everywhere: Sour Cubes, at least for now, are part of the US line, so I found these at the local Dollar Tree. White- Dragonfruit. This one has an element of lychee to it, and is pretty nice. Mild, but it’s a good flavor. Yellow- Mango. Slightly similar tasting to the dragonfruit at first, but then the core taste of a real mango breaks through. Checks out. Orange-Blood Orange. Honestly, it tasted like regular old orange to me, but it’s still yummy. I’m not sure I can even put to words how a real blood orange differs from an OG orange, so let’s just agree that it’s fine. Red-Passionfruit. Hell yeah. “that” passionfruit flavor is here through and through. Delicious. Green-Gooseberry. This one is a bit tricky to describe. Maybe like those tiny grapes? I’m sure I’ve never had a gooseberry, but regardless, this isn’t the most distinct flavor profile. It kind of washes away, unlike the other flavors. Purple-Plum. Truly, this doesn’t taste anything like a plum to me. It’s got a floral thing going on, but I can’t for the life of me say what it tastes like. I’m not really sure how they thought this tasted like a plum, but it’s still yummy. The overall note here is about the sour level: these aren’t sour. 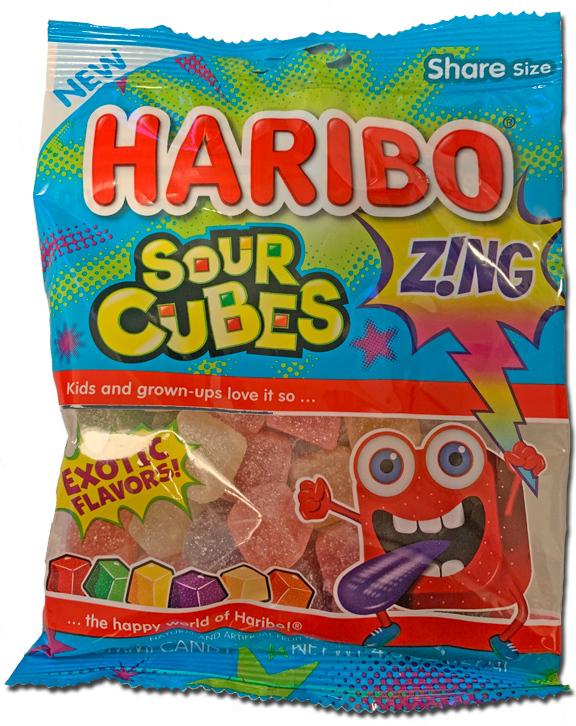 They all have a bit of tartness to them, but if you’re going for sour, this isn’t the Haribo for you. Otherwise, these are a fresh, yummy, and original variety. I’m sure I’ll buy again. Yeah not so much. I think these were pedestrian. Missing what I love about Haribo – the chew. Also, the flavors were non-descript. It feels like to me Haribo is pushing new flavors to keep up with the fickle American candy eater but there’s much better Haribo in Europe. Still.